A new paper in Nature Geoscience reports the first evidence of marine animals dissolving in acidified waters off Antarctica. 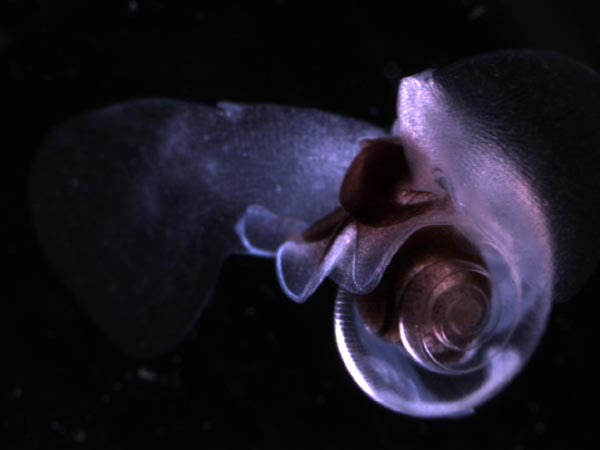 The pteropods—also called marine snails or sea butterflies—were found in waters 656 feet (200 meters) deep, alive but suffering severe shell damage from a combination of natural upwelling and human-caused ocean acidification. Natural upwelling is triggered by strong winds that drive deep cold water from the bottom to the surface. We know that many upwelled waters are corrosive to animals like sea butterflies which use aragonite to build shells. 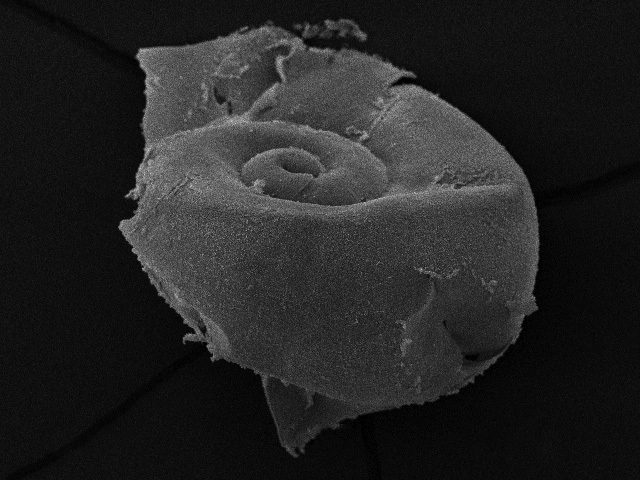 But the saturation horizon for aragonite in the Southern Ocean typically occurs at around 3,280 feet (1000 meters) deep—far below where Limacina helicina antarctica live. So what happened to hoist that horizon line 2,625 feet (800 meters) closer to the surface? “Current predictions are for the saturation horizon for aragonite to reach the upper surface layers of the Southern Ocean by 2050 in winter and by 2100 year round,” says co-author Dorothee Bakker from the University of East Anglia. Numerous lab experiments have demonstrated that OA has the potential to damage marine organisms who make shells or skeletons. This paper reports the first evidence that OA is already damaging marine life in the Southern Ocean. Marine snails are also important players in the Southern Ocean’s carbon cycle—the shuttling of carbon between atmosphere and ocean. In that work they’ve mitigated a lot of our C02 emissions. Too many for their own good, apparently. Although the upwelling sites are natural phenomena that occur throughout the Southern Ocean, instances where they bring the ‘saturation horizon’ above 200m will become more frequent as ocean acidification intensifies in the coming years. The tiny snails do not necessarily die as a result of their shells dissolving, however it may increase their vulnerability to predation and infection consequently having an impact to other parts of the food web.